» What will you do with your inheritance? One in four Americans between 18 and 59 years of age expect to receive an inheritance sometime during their lives, according to a new Interest.com survey, and they're planning to collect a substantial amount. The median projected inheritance was between $50,000 and $100,000 — or about as much wealth as we've accumulated in the typical 401(k) retirement plan. But Anthony Webb, a senior research economist with the Center for Retirement Research at Boston College, says, “The big news here is what people say they intend to do with" that family legacy. 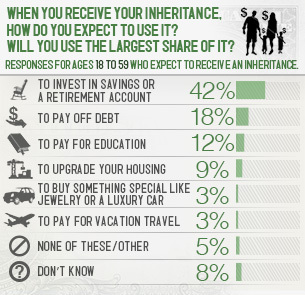 Interest.com’s poll found that 42% of those who expect an inheritance intend to save it for retirement, while another 18% say they will use it to pay off debt. Only 3% told our pollsters that they want to “buy something special like jewelry or a luxury car,” with another 3% planning to spend it on a vacation. It seems that millions of Americans are hoping to use the money passed down from prosperous parents, grandparents and other relatives to turn their financial lives around. Will they be as responsible as they claim when that day actually arrives? That's hard to tell. But it's a smart strategy, according to Mike Sante, managing editor of Interest.com. “Even a relatively small inheritance can make up for many years of living beyond your means or saving too little," Sante says. "It could be the ultimate financial ‘get out of jail free’ card for many families." It found that 27% of Americans between 18 and 59 are expecting to inherit something during their lifetimes, with a wide range of expectations for how much that might be. The largest number of those respondents — 25% — told us they anticipate receiving between $10,000 and $50,000. But another 17% reported they're planning to receive $50,000 to $100,000, while 22% see an even more sizable income of $100,000 to $500,000 in their future. To put that in perspective, the average balance in our 401(k) plans is just over $80,000, according to Fidelity Investments. The survey confirmed earlier studies that, when it comes to inheriting money, the rich generally get richer: The more someone was earning, the more likely it was that they expected to inherit a sizable amount. Fully a third of those who expect to receive an inheritance worth $500,000 or more are earning at least $75,000 annually. Still, he notes that doesn’t mean inheritances don’t matter to those further down the economic ladder. In fact, a study by Edward Wolff, a professor of economics at New York University and Maury Gittleman, an economist at the U.S. Bureau of Labor Statistics, found that it matters more. As a proportion of their net worth, inheritances and other transfers of wealth from one generation to another are actually greater for poorer households than richer ones. “That is to say, a small gift to the poor means more than a large gift to the rich,” the study concluded. Using that money responsibly can be critical for poorer households, which are more likely to have inadequate savings or excessive debt. With credit card interest rates hovering around 15%, using $20,000 to pay off credit card debt will save additional thousands down the road. Investing that money can also pay much larger long-term benefits, with an average rate of return of 6% compounding annually, $20,000 becomes more than $35,800 after just 10 years. In another 10 years, it’s more than $64,000. But Michael Finke, a personal finance professor at Texas Tech University in Lubbock, has found that people are more likely to spend smaller inheritances rather than save them. “When you receive an inheritance that’s under $10,000, you tend to frame that as spending money,” he says. Russell James, another Texas Tech personal finance professor who has studied inheritance, says there’s also a gap between intentions and actions. James also notes that people often have ambivalent feelings about inheriting money or property from family. Some may feel a responsibility to pass it on to the next generation, while others feel they didn’t deserve it or that it’s “blood money,” which can contribute to an urge to spend it quickly. However, Erin Baehr, a certified financial planner with Baehr Family Financial in Stroudsburg, Pa., says she has noticed a change in attitude among many clients since the Great Recession when it comes to inheritance or other windfalls. The plans she has heard reflect the sense of responsibility found in the Interest.com poll. “Pay off their mortgage, pay for their retirement and pay for their kids to go to college — those are the three things they most often mention to me,” Baehr says. Interest.com’s survey found a smaller percentage of people expecting an inheritance than some studies made before the Great Recession. It also revealed a significant difference between how many adults under 60 expect to receive an inheritance and how many over 60 expect to leave one. 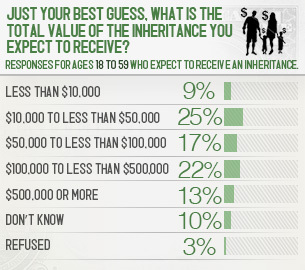 While only 27% of the younger group think they’ll inherit something, 64% of the older group expect to leave an inheritance. 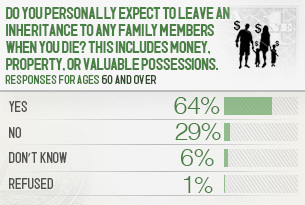 They also expect to leave more than those in the younger group say they’re likely to receive. The experts say that’s not surprising. Baehr has found people reluctant to count on an inheritance. They don’t know how long their parents or grandparents will live or what their health care costs will be in their final years, she says. The recession also left many more wary of sudden downturns in fortune. Russell also points out that it’s a difficult subject to face. On the other side, older parents may also be reluctant to share their financial situation with children, not wanting to raise expectations or encourage early requests for help. Overall, however, a 2011 study by Webb and others at the Boston College Center for Retirement Research estimated that the baby boomers have already received $2.4 trillion in inheritance and could get an additional $6 trillion. “This could be a huge opportunity for a generation that has had to take responsibility for its own retirement with the disappearance of traditional pensions and that generally hasn't put enough aside,” Sante says.